Wednesday, July 11: At the beginning of his NATO meetings in Brussels, Trump criticized NATO allies for “not paying what they should” and took specific aim at Germany ("I think it's very sad when Germany makes a massive oil and gas deal with Russia”). Thursday, July 12: Trump “jolted a NATO summit … with a last-minute demand that leaders immediately pour billions into their military budgets, raising questions about his commitment to the alliance, before he reiterated that the United States would still fight on behalf of its Western allies,” the Washington Post wrote. The president also gave an interview to The Sun, in which he criticized British Prime Minister Theresa May’s Brexit strategy. Friday, July 13: After holding a conciliatory news conference with May (“I didn’t criticize the prime minister. It’s called fake news”) and while he was meeting with the queen, special counsel Robert Mueller indicted 12 Russian intelligence officials for hacking Democratic organizations and the Clinton campaign in the 2016 election. 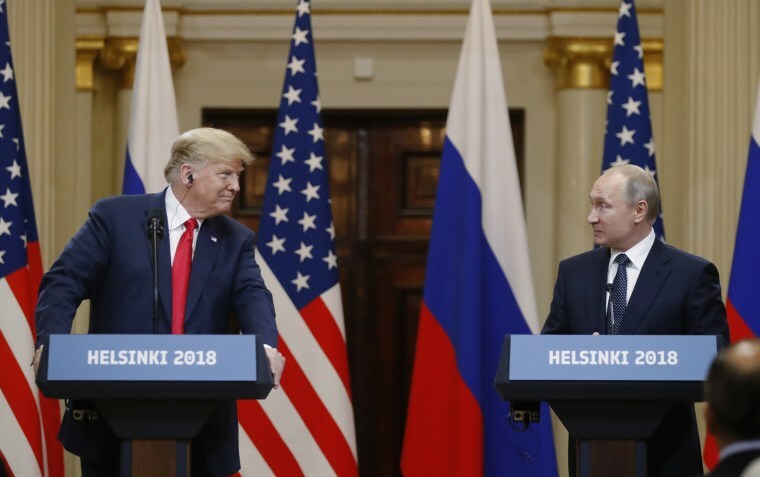 Monday, July 16: In a news conference with Russia’s Vladimir Putin in Helsinki, Trump blamed both countries for the state of U.S.-Russia relations (“I think that the United States has been foolish. I think we've all been foolish”), and he appeared to side with Putin over U.S. intelligence agencies on the question whether Russia interfered in the 2016 election (“I will tell you that President Putin was extremely strong and powerful in his denial today”). Wednesday, July 18: CBS aired an interview of Trump saying that Russia interfered in the 2016 election and that he held Putin personally responsible for it. "Well, I would, because he's in charge of the country. Just like I consider myself to be responsible for things that happen in this country. So certainly as the leader of a country you would have to hold him responsible, yes." Thursday, July 19: The Trump White House announced that it has invited Putin to visit Washington in the fall. “In Helsinki, @POTUS agreed to ongoing working level dialogue between the two security council staffs. President Trump asked @Ambjohnbolton to invite President Putin to Washington in the fall and those discussions are already underway,” Press Secretary Sarah Huckabee Sanders tweeted. And who knows what today — Friday, July 20 — will bring. Here’s Rep. Will Hurd, R-Texas, who’s running a highly competitive race for his re-election: “Over the course of my career as an undercover officer in the C.I.A., I saw Russian intelligence manipulate many people. I never thought I would see the day when an American president would be one of them,” he writes in the New York Times. Remember the story of separated migrant families at the border? Well, here are some updated numbers to remind you that the story is far from over: “The Trump administration said in a court filing late Thursday that it has reunified 364 of more than 2,500 migrant children separated from their parents at the U.S. southern border, just one week out from a court-ordered deadline,” per NBC’s Julia Ainsley and Jacob Soboroff. Speaking of the author above, we wanted to formally welcome Ben Kamisar to our team. Keep an eye out for his bylines on NBCNews.com and our Rundown blog. And check out his other work (here, here and here).